Two new murals have been approved for the Willy Street corridor on the near east side, adding to the street's already vibrant collection of artwork. Owen started the Baltimore Love Project several years ago, in 2008, spelling out the word "LOVE" in sign language on some 20 walls all over the city. The murals, according to the project's Facebook page, are "identical in regards to content, only ranging in size." Madison's mural will have the same design. On the back of the building, near Cha Cha Beauty & Barber, local artist Craig Grabhorn is designing another mural. Muralist Sharon Kilfoy, who went to the Marquette Neighborhood Association Art and Culture Committee meeting where both were approved, said it may have a "broken heart" or "heart with wings" theme. 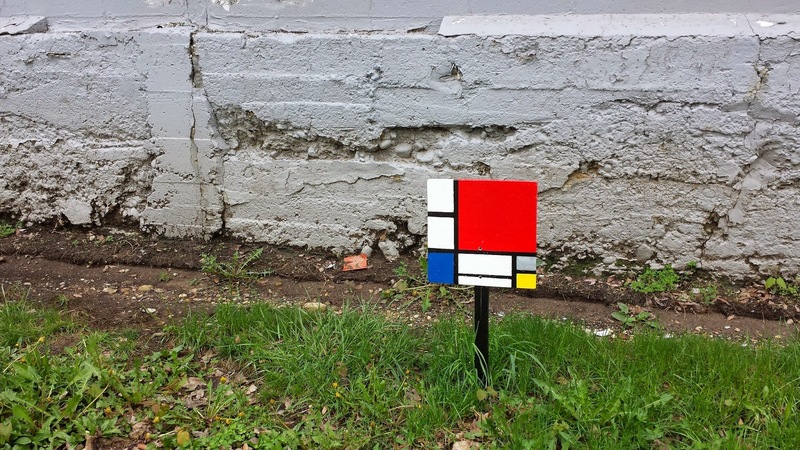 Piet Mondrian on the street, yo. East Wilson Street along the backside of the storage units. Happy spring, artists!